Longstanding US policy toward Iran calls for regime change - by war if other methods fail. Thursday's nuclear framework deal changes nothing. It's unclear what Washington will agree on during discussions toward trying to finalize agreement terms by June 30. John Kerry runs US foreign policy. He's committed to a special US/Israeli relationship. His Senate pro-Israel voting record was second to none. He was a leading voice for strengthening Israel's security throughout his Senate tenure. He remains so at State. Earlier, he opposed Iran's nuclear program altogether. He called it "unacceptable." He lied saying it compromised the security of Israel, the region, America and elsewhere. Given Iran's many concessions to reach a preliminary framework deal, it's unclear precisely to what degree he eased his former hardline position. He, Obama and virtually the entire Congress strongly support Israel. Netanyahu, likeminded Israeli hardliners, congressional Republicans and conservative Democrats intend going all-out to sabotage any final Iranian nuclear deal by June 30 or later. 1. Dismantling its centrifuge infrastructure to assure "no uranium pathway to a nuclear weapon." 2. Dismantling its Arak heavy water facility - or converting it to a light water reactor to assure "no plutonium pathway to a nuclear weapon." 3. IAEA inspectors "must have timely access to any suspect location (including restricted military sites)" to prevent (nonexistent) Iranian cheating. 4. "Iran must fully explain its (nonexistent) past weaponized efforts." 5. Sanctions relief must be gradual "to allow time to judge Iranian compliance." 6. "Given Iran's (nonexistent) history of cheating, an agreement constraining (its) nuclear program must be enforced for decades, not years." Israeli demands should be supported across the board. AIPAC and lunatics infesting Washington irresponsibly call Tehran a regional threat - deal or no deal. They want Iran marginalized, contained, weakened, denied its fundamental rights and eliminated as an Israeli political rival. They want war if objectives aren't reached other ways. Two proposed Senate bills are hardline. The Nuclear Weapon Free Iran Act (NWFI) requires new sanctions if Tehran leaves negotiations or violates terms agreed on (true or false). The Iran Nuclear Agreement Review Act of 2015 (INAR). prohibits sanctions relief for 60 days with Congress having final say. Obama said he'll veto both bills. Reports indicate they're close to veto-proof support. On April 14 Senate Foreign Relations Committee members will vote on INAR. "Congress must be allowed to fully review the details of any agreement before any sanctions are lifted." "(M)y longtime concerns about the parameters of this potential agreement remain, but my immediate concern is the administration signaling it will provide near-term sanctions relief." "A nuclear-armed Iran would lead to a less safe and less secure world, which is why the stakes are so high in the pursuit of a strong agreement that is fully enforceable, verifiable and is in our national security interests." "(W)e must remain clear-eyed regarding Iran’s continued resistance to concessions, long history of covert nuclear weapons-related activities, support of terrorism, and its current role in destabilizing the region." "If a final agreement is reached," Congress should have final up or down say. Israel intends exerting intense pressure to kill anything in an eventual Iranian deal it rejects. Netanyahu and likeminded Israeli lunatics fabricate threats they nonsensically claim jeopardize Israel's survival. "This deal would pose a grave danger to the region and to the world and would threaten the very survival of the State of Israel,"
"The deal would not shut down a single nuclear facility in Iran, would not destroy a single centrifuge in Iran and will not stop R&D on Iran's advanced centrifuges." "On the contrary, the deal would legitimize Iran's illegal nuclear program." "It would leave Iran with a vast nuclear infrastructure. A vast nuclear infrastructure remains in place." "The deal would lift sanctions almost immediately - and this at the very time that Iran is stepping up its aggression and terror in the region and beyond the region." "In a few years, the deal would remove the restrictions on Iran's nuclear program, enabling Iran to have a massive enrichment capacity that it could use to produce many nuclear bombs within a matter of months." "The deal would greatly bolster Iran's economy. It would give Iran thereby tremendous means to propel its aggression and terrorism throughout the Middle East." "Such a deal does not block Iran's path to the bomb. Such a deal paves Iran's path to the bomb." "And it might very well spark a nuclear arms race throughout the Middle East and it would greatly increase the risks of terrible war." World power should pressure Iran "until a good deal is achieved." "Iran is a regime that openly calls for Israel's destruction and openly and actively works towards that end." "…I want to make clear to all. The survival of Israel is non-negotiable." "Israel will not accept an agreement which allows a country that vows to annihilate us to develop nuclear weapons, period." "In addition, Israel demands that any final agreement with Iran will include a clear and unambiguous Iranian recognition of Israel's right to exist." 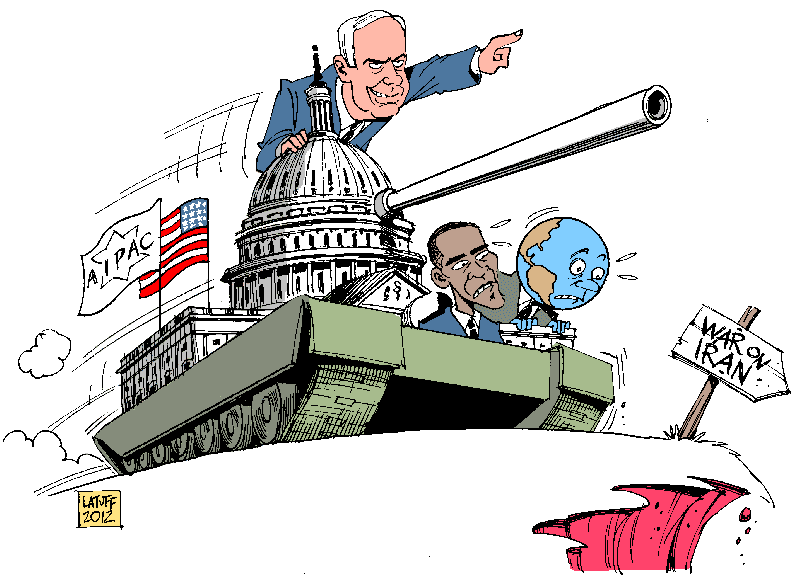 Separately, Netanyahu told Obama framework terms agreed on threaten Israel's survival. Fact: Iranian nuclear program framework terms agreed on threaten no one - now or any time ahead. Fact: Israel's illegal and formidable nuclear, chemical and biological arsenals threaten world peace. Fact: Iran has as much right to develop and use nuclear power as dozens of other countries not criticized. Fact: Iran's infrastructure and operations fully comply with Nuclear Non-Proliferation Treaty (NPT) provisions. Fact: Israel refuses to sign NPT. It's a known nuclear outlaw. Fact: No Iranian "aggression" or "terror" exists in the region or elsewhere. Fact: Iran deplores nuclear weapons. It's the region's leading proponent for abolishing them altogether. Netanyahu's bluster lost credibility long ago. He and likeminded Israeli lunatics are force to be reckoned with. Whether they'll wage war on Iran if their objectives aren't achieved other ways remains to be seen. Israel, its US Lobby and most congressional members intend going all-out to sabotage any final nuclear deal with Iran. Longstanding anti-Iranian sentiment suggests no fundamental US policy change ahead - deal or no deal. The risk of America and Israel eventually waging war on Iran to replace its government with a pro-Western one remains high. The fate of the region hangs in the balance - perhaps world peace.